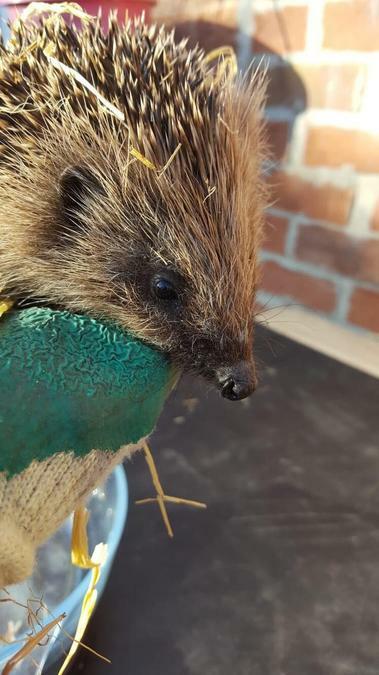 Our hedgehogs are doing really well in our care over the winter time. Harold is a shy hedgehog and she doesn't like having her photo taken. Harold on the other hand is a bit of a show off ! This is Horis on Saturday 16th February. Harold and Horis come to The Green Infant School. 9th January 2019: Mason and George from Year 1 helped to care for the hedgehogs today. Horis (blue spot) and Harold (red spot) have come to stay with us during winter. The children and Mrs Ballard will be weighing, feeding and checking them every day. They will keep a diary sheet of their progress. During holidays and weekends they will go home with staff members. Here are a few fascinating facts about our special little visitors. Hedgehogs are nocturnal which means that they sleep in the day and only come out at night. The 'Hedge' part of their name comes from where they build their nests hedges, bushes and shrubs. The ‘hog’ part comes from the small snorting/ grunting sound they make which is similar to a pig/ warthog. Hedgehogs have the ability to hibernate (although not all do), which makes them one of only three mammals that hibernate in the UK. Hibernating means that they curl themselves up and stay in a dormant state for winter. Hedgehogs are actually lactose intolerant, so milk should never be left out for them, water is perfectly fine. The hedgehog was not always called a hedgehog. Before this they were called Urchins which led to the naming of Sea Urchins. Hedgehogs have a really long snout to help them hunt. It is even ahead of their mouths as it makes it easier to forage for their staple diet of insects, worms, caterpillars and berries. They hunt primarily using they hearing and smell because their eyesight is not very good, although they can see quite well in the dark. There are 15 different species of hedgehog in the world. Each are similar but have small characteristic and habitual differences. The UK only has one native species, the European Hedgehog. Hedgehogs have around 5000 to 7000 spines on their back. These can be raised and lowered to respond to threatening situations. Each quill/ spine lasts about a year before dropping out and being replaced. The hedgehog has a vulnerable stomach, which is why it curls up into a spiky ball when predators such as badgers are around. If a hedgehog smells or tastes something really strong, it will attempt to cover itself in foamy saliva, much like a cat cleaning itself. This is called self-anointing. Hedgehogs venture out on their own after only four to seven weeks of nurturing from their mother. They usually then spend their entire lives alone with the exception of pairing up to mate with another hedgehog. It is extremely rare that you will see multiple hedgehogs together in one place other than when mating, but if you do it is called an array. Hedgehogs have earnt this reputation because of their eating habits. Not only do they enjoy berries and fruit but most of their diet is made up from pests that are common in our back gardens such as beetles and caterpillars. This helps preserve the fruit and vegetables you may have growing in your gardens. When hedgehogs are out to forage in the evening, they can travel for up to 2 miles, that's a long way for little legs.